Now why would these two low-lifes want to knock off a nice small-town gas jockey like Pete Lund? The Swede wasn't doing anybody any harm. Sure, his prices could've been lower and he was a little slow with a dipstick and his windscreen wiping wasn't all that hot but that's hardly enough to justify putting a pair of bullet holes through the big man's heart. "I did something wrong, once," was all Pete himself would say from his grotty deathbed. An enigma to the last, old Pete. So much so, in fact, that Pete wasn't his real name at all, as claims investigator Jim Reardon is about to find out. Produced for Universal by Mark Hellinger and expanding upon a short story by Ernest Hemingway with a script by Anthony Veiller, Richard Brooks and an uncredited John Huston, this is the sort of noir you think about whenever anyone mentions the subject. In fact it's a kind of amalgam of all the genre's greatest hits and key touchstones. It's got a tough guy hero doomed from the start (former acrobat Burt Lancaster in his first starring role), a double-crossing dame in the vampish form of Ava Gardner, moody, desperate lighting from Elwood Bredell and surly thugs up the wazoo. 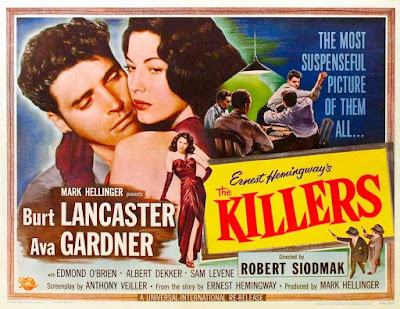 Like Out Of The Past (1947), The Killers begins with a gas station attendant being confronted by old acquaintances from a period in his life he'd rather forget. 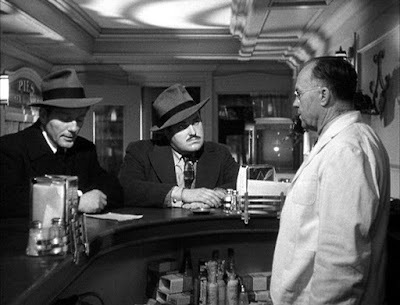 Like Double Indemnity (1944), its main character is an insurance investigator embroiled in a mystery. And like Citizen Kane (1941), it's an episodic recreation of a dead man's life told mainly in flashbacks through anecdotes recited to an audience cypher by the last people who knew the late lamented. Lancaster is splendid as the Swede (A.K.A. Ole Andreson), a dopey, lovestruck ex-boxer prepared to do anything it takes for the wrong woman - even go to jail or stick-up a hat factory. The character is almost a matinee idol version of Moose Malloy from Raymond Chandler's Farewell, My Lovely (1940) and a million miles away from Lancaster's fiercely intellectual J.J. Hunsecker in Sweet Smell Of Success (1957). Gardner too is just the right mix of sweetheart and she-devil, manipulating the Swede on behalf of her crime boss husband - a memorably oily Albert Dekker. Although this sultry pair cornered all the marketing, it's the ever-underrated Edmond O'Brien who truly carries the film as Reardon, as principled, patient and unshowy a hero as you're ever likely to meet. German expressionist Robert Siodmak's direction is good, the screenplay is good, the performances are good but, arguably, only the early scene in the Brentwood diner leading up to the Swede's murder is truly great. The fact that these opening moments are the only part of the whole yarn based on its source is telling (Hemingway apparently enjoyed The Killers so much he didn't drink a drop of the medicinal gin he'd taken into a preview screening, fearing the worst). The boxing scenes are strong, however, and seem an obvious inspiration for Raging Bull (1980), all flash bulbs and steam rising from lank, sweating muscle. Painter George Bellows and his famous A Stag At Sharkey's (1909) could have been a source. In truth though, The Killers is a little too workmanlike for all its many qualities and style. It's not really about anything substantial and there's just something missing, some essential, undefinable something that's not there and ought to be. The stuff that dreams are made of, perhaps. A shame to admit it but, hey, it's a crowded field. There's a lot of bodies out there waiting to be turned over and the Swede's won't be the last. I agree w/your point, that the opening scene is a 'killer' (pun intended), as taken straight from Hemingway. McGraw & Conrad are terrific also. And O'Brien does carry the movie. I read somewhere that Audrey Totter had first been offered the femme fatale role before Ava Gardner. Wonder what kind of difference blonde Audrey would have made compared to brunette Ava? Enjoyed your excellent post! Hi there, thanks very much for the comment and I'm glad you enjoyed the post! I remember Audrey Totter from 'The Postman Always Rings Twice' - I daresay she would have done a fantastic job. I've just been checking out Grand Old Movies and have added you to my blogroll. I particularly loved your article on W.C. Fields - I am a huge, huge fan and have written about the Great Man a couple of times on here. Delighted to know he's not being forgotten. I enjoyed your article, as well as your excellent writing. (I posted a comment here yesterday, and shared your review on Twitter, but my comment seems to have vanished into cyberspace. Try, try again...). I look forward to reading more! Wow, thanks very much Karen. I'm sorry your earlier comment didn't post - not sure why that was. I love your blog by the way - really beautiful and insightful.